In fact, there are five critical physical material aspects to consider when completing or ordering acrylic face-mounts in order to get the results you are looking for. First of all, an essential aspect to acrylic face-mounting is the choice of photograph paper or print media. 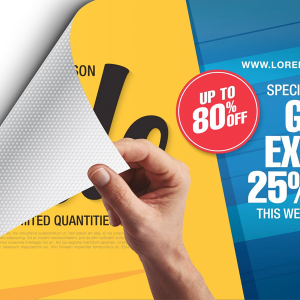 Use only top-of-the-line photo paper for an acrylic project print – remember you’re creating an eye-catching display. The most popular photo paper – and the one I prefer for most projects – is a metallic paper. Be it metallic satin or metallic glossy, metallic paper truly enhances the vibrancy of the photograph. However, not all pictures call for metallic paper; portraits, for example, very often benefit from a photo paper with a pearl finish. Every surface has a Roughness Average (RA) and, keeping that in mind, the smoother the surface of the photograph, the better your results when face-mounting. If you do not have a completely smooth surface, you may see very tiny air bubbles in your print called silvering – not something you want in your finished photographic display. Next on your list is the acrylic itself. Not all acrylic is alike. Specifically, there is a choice between cell cast acrylic and extruded acrylic. Cell cast acrylic is harder, has a more uniform thickness, is more scratch-resistant and is typically clearer than extruded acrylic. Most people in the industry only use cell cast acrylic for face-mounting, regardless of the thickness. If you are shopping around for a face-mounted photograph, always ask the vendor what type of acrylic they are using. If they tell you that all acrylic is the same, chances are they are using sub-par material and you may well have issues in the future. There is also a vast range of prices, from cheap acrylic only good for running experiments, to museum-quality acrylic that sells for four-figure sums per sheet. A reliable business will talk you through the options. The third essential aspect to face-mounts is an optically clear mounting adhesive, a two-sided adhesive that is used to adhere the photograph to the acrylic. It’s imperative that this is of the highest quality to ensure a clear picture with no distortion. Drytac’s product, specifically designed for this application, is called Facemount® – a pressure-sensitive permanent mounting adhesive protected on each side by a clear polyester release liner. Drytac’s Facemount® has been valued and relied on in the fine art sector for more than 30 years. Facemount® is engineered for the face-mounting of virtually any image to clear substrates like PetG, Plexiglas, acrylic and polycarbonate, which means that it is a fantastic option for high-quality photographic and inkjet printed images. It is particularly good for lenticular imaging applications, backlit display transparencies and touchscreen displays too – it really is of the highest quality in the market. You should also consider the backing to be used with your photograph – indeed, this could be the most important aspect if you are hanging your picture on a wall. The backing must support the weight of your acrylic without tearing away from the back of the photograph to which it is adhered, and also maintain its adhesion to the mounting hardware. For wall-hung pictures, Dibond backing or coloured 1/8″ cast acrylic sheet is typically used. Dibond is basically an aluminium sandwich: a composite that consists of a high-strength aluminium skin on both sides, sandwiching a super-strong polyethylene centre core. It provides the utmost protection to the back of your picture while providing an incredibly strong substrate from which your acrylic can safely hang. The same applies to cast acrylic backings. This step requires another double-sided adhesive to bond the back side of the image to the backer –Facemount®. Which backing to use depends on the hanging system, and this is the final critical aspect when acrylic face-mounting a print. No matter how good your backing is, if your hanging system fails, then everything else ceases to matter. It should be large enough to support the weight of the material, for if the weight exceeds the dimension of the hanger it will pull away from the backer, causing a failure. A cleat style hanging system requires Drytac Facemount® to be used on the front and back of the photo, because Facemount® has a very high shear strength and will hold, whereas other mounting adhesives have a lower shear strength and the acrylic and image will eventually release from the backer over time. This could cause the image to slide down the backer, or simply separate altogether. Alternatively, standoff style hanging systems are essentially metal bolts that hold an image to the wall with anchors installed into the wall surface. This style of hanging system will provide enough weight distribution and support lower shear strength options as the adhesive for the backer. This is because the standoff goes completely through the sandwich of the Facemount®, holding it together and supporting the entire weight of the piece on all four corners from front to back. With this system, there is no way for the image to slide down the backer because they are supported equally. There are other hanging systems that are patented; research all the types to find the best system to meet your needs. Acrylic face-mounted prints can look great. 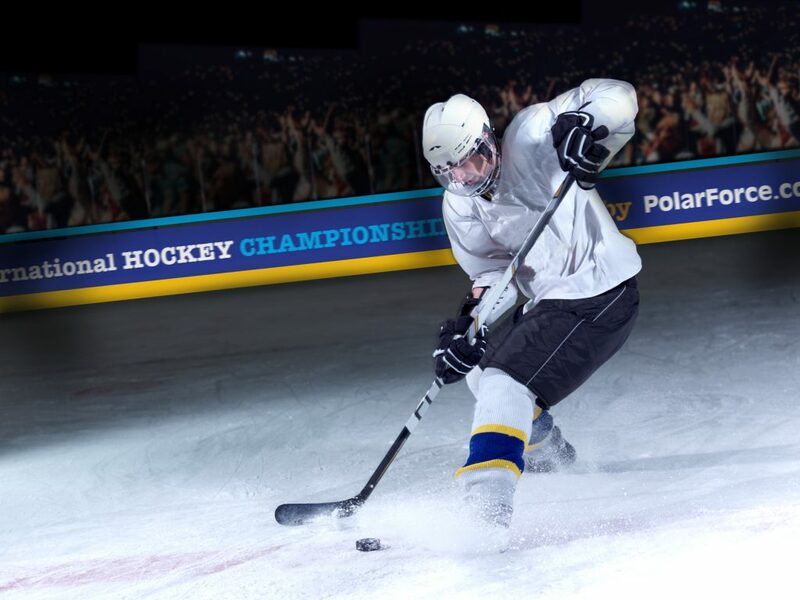 Make sure you choose the right photo paper or print media, acrylic, optically clear mounting adhesive, backing and hanging system to make them look incredible. Authored by Steve Yarbrough, Product Support Specialist at Drytac. It’s essential to use the right media for each project. 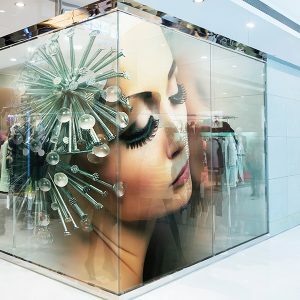 At Drytac, we’ve developed an incredible range of window graphics materials to help you choose the best product for the job, with a few things to consider. First, it’s crucial to check with the client exactly what they want from their window graphic. Do they need a window graphic that is only visible from the outside, or inside the building as well? This will dictate both which material and type of printer to use. Has the customer requested an optically clear finish? If so, you don’t want to use a contact clear material. Do the colours need to be totally accurate? Check colour profiling and matching, asking the client to approve any colours before installation – perhaps printing a few colour swatches on the material to examine on site. Drytac window graphic materials are rated for either indoor or outdoor use to help you choose the right media – it’s important to ensure a good finish and the required lifespan. Similarly, the printer must be compatible with your chosen materials, as certain ink sets may require top coats or laminates to ensure longevity. And never use a permanent adhesive for a temporary graphic: this will cost you later in time and money for removal and clean up of adhesive residue! We also advise against using a material that will trap heat in a window, as this can cause expansion and shatter the window. These include multi-layered block-out materials, but do your research and ask the manufacturer if you have any questions at all. They may even have a new product, perfect for your project, that you don’t even know about. Finally, don’t choose sub-par materials and expect top-quality results. The difference will show in clarity, adhesion and overall performance. Drytac has developed a fantastic range of materials specifically for different window graphics applications to help you achieve a finish to be proud of. 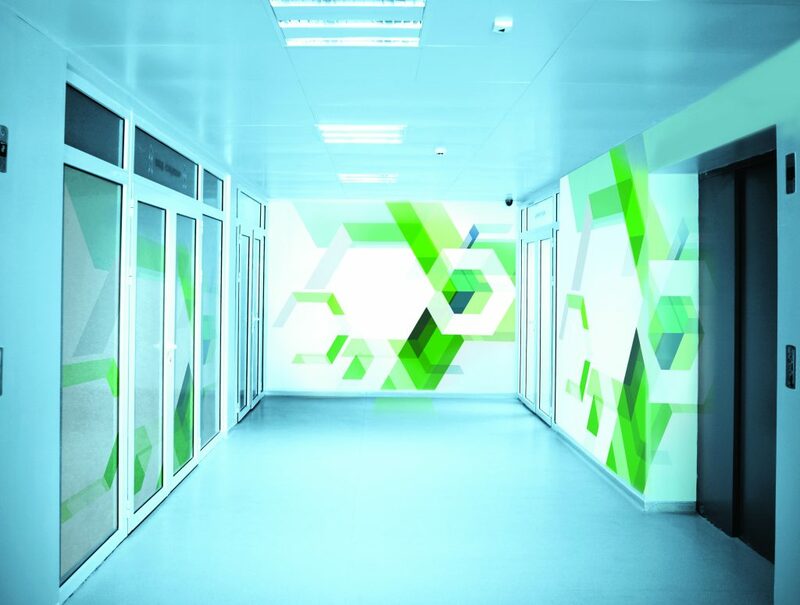 For an easy installation of short-term graphics, for example, SpotOn is a 4 mil (100 micron)-thick vinyl with a ‘dot pattern’ adhesive which makes it simple to fit, reposition, remove and even reuse. Available in clear matte, clear gloss, white matte and white gloss, and compatible with solvent, eco-solvent, latex and UV inkjet printers, SpotOn is an incredibly versatile media. WindowTac, too, is great for temporary graphics on glass, acrylic and other non-porous surfaces, especially for backlit displays. 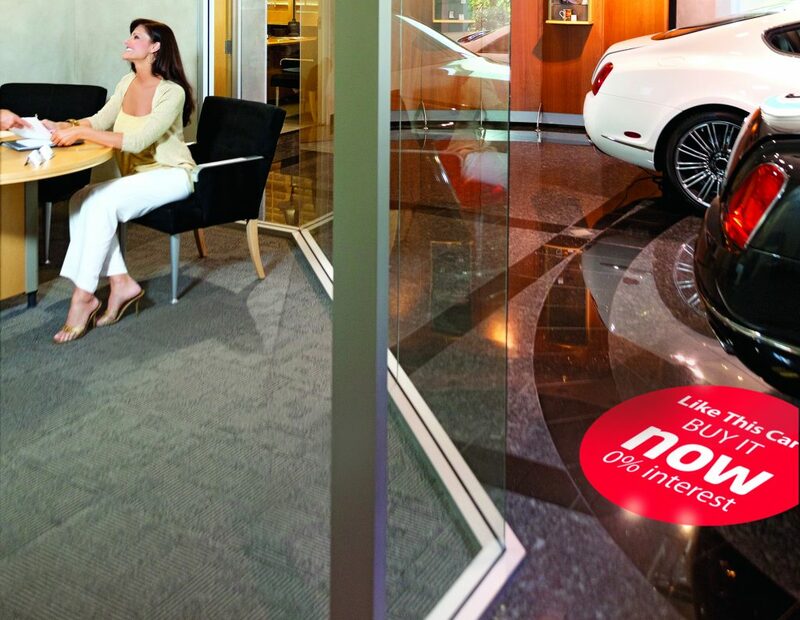 This 0.9 mil (23 micron), visually clear PET film can also be installed with minimal effort. 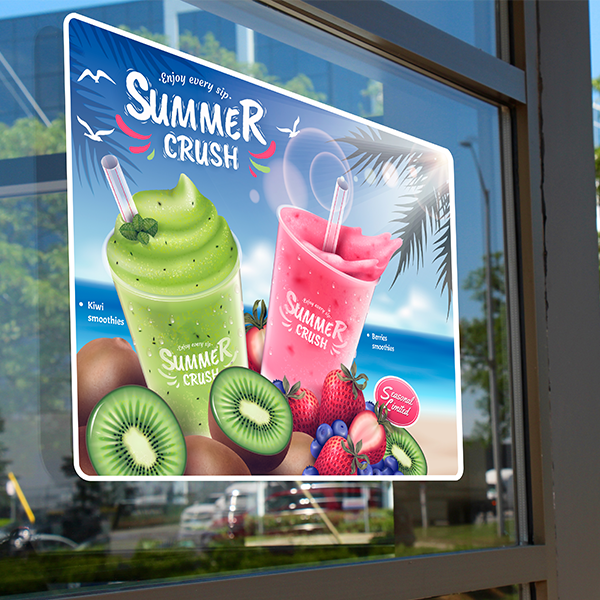 Or, for longer term window graphics, take a look at ViziPrint Impress Clear, a 5 mil (125 micron) optically clear PET film with proprietary adhesion technology that can withstand both high and low temperatures and moisture. Available for UV, solvent, eco-solvent and latex inks, you can expect great graphics for years, and clean removal up to three years after installation. From the same range is ViziPrint Illuminate, a 4 mil (100 micron) high quality, translucent matte PET film that uses a mechanical bond to adhere to smooth, flat surfaces such as glass. Reverse printable and durable even without over-lamination, its bright white base colour creates brighter, more vivid window images. Explore the full Drytac range to choose the perfect material for your window graphic project.